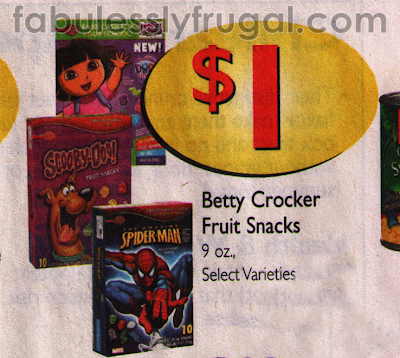 Fabulessly Frugal has uncovered an amazing sale on Betty Crocker Fruit Snacks starting Wednesday, March 3 at Albertsons. And keep rolling until you tire of the deal or you don’t want anymore. You should be able to print two coupons per computer from each link. I highly suggest you print all the coupons you need now. You just never know when they will pull them. also there is another printable fr the BC fruit snacks at target.com it says manuf. coupon and does not have the target logo. I used it today with no problem. It even has the same barcode as the other sites but it does not say DND. My store in Eugene, or had all BC fruit snacks, fruit rolls ups, gushers, fruit by the foot, at $1 so I went to a few stores and bought 6 per transaction. I did 6 transactions. Used 3 coupons and 3 doubles and got $3.50 catalina. I even had some $1 on 2 box peelies and $2 off survey on receipts. Total for 36 boxes, and 3 starkist albacore tuna pouches was $1.99 OOP and have $14 in catalina’s I walked away with (since I spent a few to make OOP zero). that’s a $12.01 money maker. Catalina was printing on fruit rolls, gushers, and fruit snacks. Don’t forget, you’re spending $4.00 each time (either all cash, or cash + your cat from previous transaction), and getting a $3.50 catalina each time – so every time you’re spending $.50. You’re spending $.10 on each box, so it’s not a money maker. Elizabeth is right. You’ll never end up walking away with more “money” (in whatever form) than you started with. No matter how many times you roll the cats, you’re always going to end up having spent $4 to on the first transaction and ending with a $3.50 catalina. Each time you run the scenario costs another $.50. That being said, I’ll be the last person to complain about $.10 a box. It IS a moneymaker (not actual cash) but you just walked away with $3.00 you didn’t have before. It is the same with register rewards, gift cards, etc. You just made $3.0o, it’s just in the form of a catalina. What you choose to spend it on, it doesn’t matter and doesn’t equate making money. Maybe someone needed 15 fruit snacks. They just made $3.00 to buy them. Good deal, but this is NOT a moneymaker as you are spending your $3.50 cat and $.50 to just get back another $3.50 cat. I find it interesting that you say there is $3 of overage in your second transaction. True, you receive a $3.50 catalina – but you also just SPENT a $3.50 catalina (which could have otherwise been spent on milk, bread, produce, etc.). So I don’t really see it as profit if I come out of the deal with the same amount of $$ in catalinas as I went into the deal with. To look at it another way, when you received the catalina originally, even though you spent $4 oop, you say final cost: $.50 because you factor in the catalina. But then, you factor it in AGAIN during your second transaction when you spend it and say you have a “$3 overage.” So you’ve considered the same catalina in your savings for two different transactions. I hope that makes sense. I just want people to be cautious and realize that you’re actually going to be spending $.50 every time you buy five boxes…. so this is not a money maker – just a really good deal. Thanks for the link love Angela! Hey – there are also $1/2 coupons for the fruit by the foot snacks in the Betty Crocker home mailer coupon book. If those snacks are included in the $1 sale – that would really be a nice MM. Those coupons can be doubled also! Does anyone know where the albertsons doublers are in the paper today? I’m in Southern Oregon visiting, but we still got the Sunday early edition Oregonian and we can’t find them!! Are we sure the coupons will work for those snacks? They state they are good for the Fruit Roll Ups, Fruit By The Foots, and/or Gushers. These three are usually included in Fruit Snacks sales. We’ll have to wait until Wednesday to confirm, though. I believe that the 2nd is a Tuesday- I think you meant to say the 3rd…?